Western blot analysis of extracts from 293T cells, transfected with 100 nM SignalSilence® Control siRNA (Unconjugated) #6568 (-), SignalSilence® Cbl-b siRNA I (+), or SignalSilence® Cbl-b siRNA II #12122 (+), using Cbl-b (D3C12) Rabbit mAb #9498 (upper) or GAPDH (D16H11) XP® Rabbit mAb #5174 (lower). The Cbl-b (D3C12) Rabbit mAb confirms silencing of Cbl-b expression, while the GAPDH (D16H11) XP® Rabbit mAb is used as a loading control. CST recommends transfection with 100 nM SignalSilence® Cbl-b siRNA I 48 to 72 hours prior to cell lysis. For transfection procedure, follow protocol provided by the transfection reagent manufacturer. Please feel free to contact CST with any questions on use. 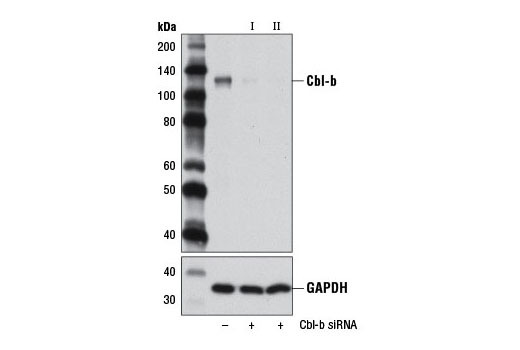 SignalSilence® Cbl-b siRNA I from Cell Signaling Technology (CST) allows the researcher to specifically inhibit Cbl-b expression using RNA interference, a method whereby gene expression can be selectively silenced through the delivery of double stranded RNA molecules into the cell. All SignalSilence® siRNA products from CST are rigorously tested in-house and have been shown to reduce target protein expression by western analysis. The Casitas B lineage lymphoma (Cbl) proteins (in mammals these are c-Cbl, Cbl-b, and Cbl-c) are a family of single subunit RING finger protein-ubiquitin E3 ligases that contain multiple protein interaction motifs (1). All Cbl proteins have a highly conserved N-terminal tyrosine kinase-binding (TKB) domain that mediates interactions between Cbl proteins and phosphorylated tyrosine residues on Cbl substrates. C-terminal to the RING finger, Cbl proteins have proline-rich domains that mediate interactions with SH3 domain-containing proteins. Phosphorylated tyrosine residues mediate interactions with SH2 domain-containing proteins such as the p85 subunit of PI3K. These protein-protein interaction motifs allow Cbl family proteins to function as adaptor proteins (2). This adaptor function contributes to the E3-dependent activities of Cbl proteins by targeting specific substrates for ubiquitination and degradation. The adaptor function also contributes to non-E3-dependent activities, such as the recruitment of proteins involved in receptor tyrosine kinase internalization, localization of Cbl proteins to specific subcellular compartments, and activation of discrete signaling pathways (1). Cbl-b is an E3 ubiquitin ligase with a domain organization nearly identical to that of c-Cbl. The role of Cbl-b in hematopoietic cell physiology is well documented. Cbl-b expression is important for the downregulation of TCR expression during antigen recognition (2). Cbl-b also acts as a potent negative regulator of the CD28 signaling cascade to Vav and Rac1 through its ability to ubiquitinate the p85 regulatory subunit of PI3K (3,4). As a critical regulator of clonal anergy in T lymphocytes, Cbl-b mRNA and protein are upregulated in T cells following calcium mobilization and calcineurin activation (5). Cbl-b-deficient T cells are resistant to anergy induction (5). The molecular events governing this phenotype are thought to be linked to defects in the ubiquitination of PLCγ1 and PKCθ since the degradation of these signaling molecules, which occurs following restimulation of wild-type anergic T cells, fails to occur in Cbl-b-deficient T cells (5). Schmidt, M.H. and Dikic, I. (2005) Nat Rev Mol Cell Biol 6, 907-18. Naramura, M. et al. (2002) Nat Immunol 3, 1192-9. Chiang, Y.J. et al. (2000) Nature 403, 216-20. Fang, D. and Liu, Y.C. (2001) Nat Immunol 2, 870-5. Heissmeyer, V. et al. (2004) Nat Immunol 5, 255-65.